Settling for a low quality Panasonic UF6300 toner isn't advisable. Consequently, we give you our full guarantee so there's no reason to feel unhappy. We'll offer you a complete refund in the unlikely event that your Panasonic UF6300 toner fails to meet perform dependably. Buy today from Cartridge Save to save! The Panafax UF-6300 is one of the most innovative products by Panasonic, featuring a fax hybrid solution that combines G3 and email to help improve productivity in the office. The generous memory capacity, PC fax driver, and automatic document feeder are additional time-saving features of the Panasonic Panafax UF-6300, while the high paper capacity of the paper tray makes it efficient for large-volume jobs. However, it is quite intimidating to operate because of the busy control panel. Measuring 370mm wide, 253mm tall, and 370mm deep, the Panasonic Panafax UF-6300 plain paper laser fax may seem bulky at first, but it is rather compact for the standard desktop. Its centrepiece is the busy control panel with the full QWERTY keyboard, a separate numeric keypad, a small display screen, a d-pad, and one-touch operational buttons. The lower left-hand side of the Panafax UF-6300 printer has room for an optional telephone handset. Users can connect this device to their PC using a parallel cable. 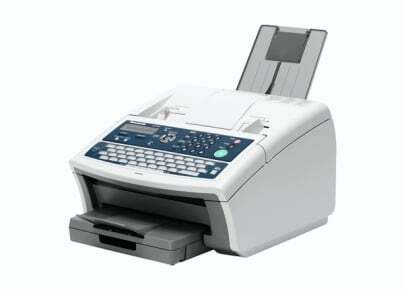 The Panasonic Panafax UF-6300 laser fax uses an all-in-one Panasonic UF-6300 cartridge, which is good for 8,000 pages. Larger jobs can be stored in the memory when the 50-page automatic document feeder cannot accommodate them any more. The Panafax UF6300 is fast with 33.6Kbps transmission speeds and super G3 compatibility, while one-touch scanning saves time. A maximum of 500 sheets can be supported by the input tray of the Panasonic Panafax UF-6300 fax machine while the output tray can hold up to 100 sheets. Junk faxes can be blocked and 340 entries can be stored in the auto-dialler. The control panel is one of the downsides of the Panasonic UF-6300 multifunction printer because of its busy and cluttered appearance, which includes an actual QWERTY keypad. The device is notably heavy and boxy, too, which makes it difficult to transport and set-up. The Panasonic Panafax UF 6300 fax could be better if it had a larger display screen.